OK, so which you wanna hear first? Get the bad news out of the way? OK. 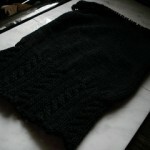 I motored along on Maude, getting the the armhole decreases last night. Now that only half the stitches are on the needles at once I was able to try it on for the first time. It’s too big. Not huge. But definitely a bit drapey. It may shrink up a bit after a bath. If it doesn’t, I think I’m going to take some off the sides by steeking them. What do you think? 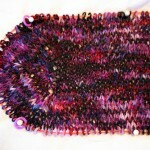 The biggest benefit I can see for doing this – no ends to weave in! The ends would be cut off as part of the steek. I think there’s a really good chance I’ll have to do this (or frog the whole thing) so I may finally try my hand at steeking! I’ve been really struggling with what pattern to make out of the linen drape. I love the yarn. Love the color. But I was totally missing design inspiration. Until yesterday. I’m designing my own sweater and I’m VERY excited about this one. 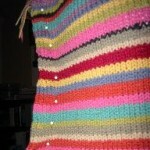 It’s going to challenge me to get a really good fit, and there’s a healthy dose of crochet in there as well. The color I picked is called Tango (a claret red) and the design I’ve come up with is very Spanish-inspired as well. I’m not going to give away many of the details on this one, as I think it will be fun to reveal the design as I go. However, there is one thing I need some help on. Crochet instructions. All you hookers out there, can you clarify something for me? I’ve finally added links to some of the blogs I read. I just started working on this list so it will definitely grow. Please don’t feel insulted if your blog isn’t there. It’s probably because I just haven’t added it to the list yet. I’ve put off creating this list for such a long time now because I’ve been afraid of hurting someone’s feelings by not having their blog listed. 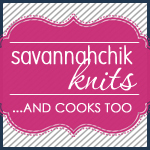 There are so many good knitting blogs out there! Yes, you put your hook into the actual space between the two stitches. At least, that is how I interepret your pattern. Yes, the crochet hook goes into the space under the chain two. Your sweater may unravel if it is steeked. 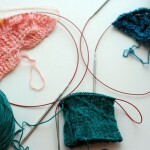 With wool sweaters, the yarn ends sort of grab each other, preventing the whole thing from unraveling. The cotton probably won’t behave this way. Maybe if you machine stitch up the sides before cutting, the stitches would hold everything in place. There seems to be a lot of summer top fit issues going around. Check out Wendy’s blog today. By all means, machine stitch and steek away if it doesn’t fit right. No clue how to hook. And I am very sorry to hear/see that Maud is possibly too big. That stinks! I have no clue about steeking. I hope you get helpful answers. I love the color of the stripes though.